Damascene is a process in which non precious metals are decorated with 18-24K gold in decorative patterns. During the procedure, artisans cover the surface of an object with fine grooves, using sharp cutting tools. Figures are then drawn on the scored surfaces. Next gold wires are pressed into these grooves with a steel punch and hammer. Figures are then drawn on the scored surfaces. The whole item is then blued to produce a black background by a total oxidation of the surfaces which are not damasked. A delicate and light process of chipping gives a lovely sheen to the object. Finally, the piece is mounted to give the final object. 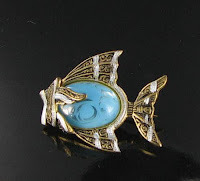 Damascene jewelry is one of the specialites of my main website Vintage Jewelry Lane. I have a very large range of it, at competitive prices. 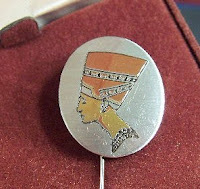 There are several styles of damascene jewelry, most notably Tourist damascene, Amita damascene, and Reed and Barton Damascene. Each type has quite a different look to it. 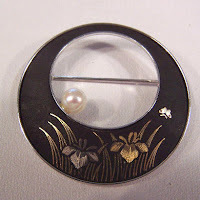 I've written a reference article with lots of information on damascene jewelry, and photos to explain each style. You can find the damascene article here. Here are some photos of pieces that I currently have for sale. You can click the pics to get more details. Prices range from $15.99 to $49.99 for the pieces featured here. Other styles start at $11.99. 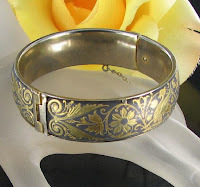 I have many more styles on my sites - Vintage Jewelry Lane. My favorite style of damascene jewelry is the Reed and Barton style, but all of the styles are collectible in their own right. Hello .... My aunt has given me a present! Now, I need to find out what it is; how old it is (it is old; she was in her early 100's); and does it have a value so I know where to keep it? Do you know anyone who has such knowledge to know what this is? Heart shaped engraved pendant. I'm afraid I don't know how can to help you acquire this sort of information. 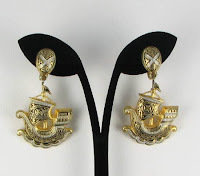 Most of the vintage jewelry websites that I know of do not do appraisals. 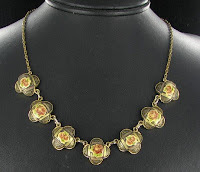 If there is an antique store in your area which sells old jewelry, you might be able to get some information there. Hackers really need to get a life! Thanks for letting me know. I'm working on getting it back to normal now. 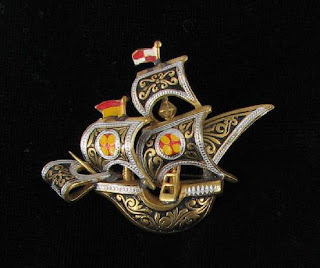 Vintage Jewelry Designer of the Week - Who am I?